Extreme stock market volatility overshadowed the stream of largely positive U.S. economic news released last week. Here are the 5 things we learned from U.S. economic data released during the week ending August 28. 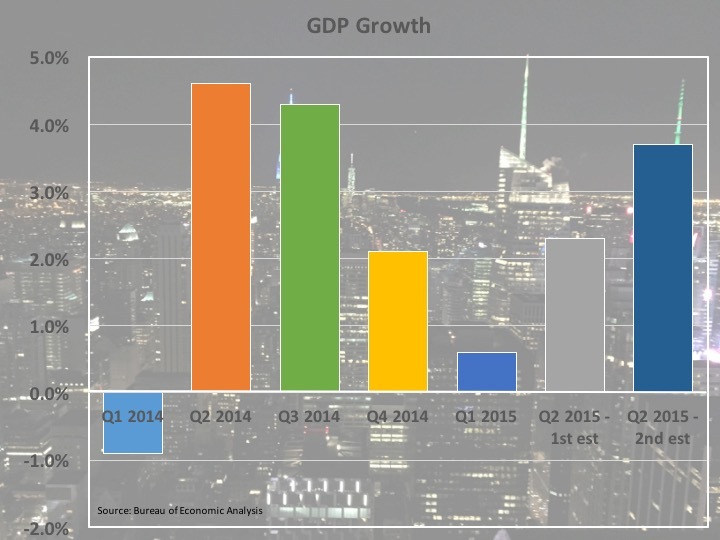 Q2 was a better much quarter for economic growth than previously believed. The Bureau of Economic Analysis sharply revised upward its estimate of seasonally adjusted annualized growth in the Gross Domestic Product (GDP) from +2.3% to +3.7%. This follows the +0.6% SAAR economic expansion during the first 3 month of the year. The upward revision was the result of improved results for nonresidential fixed investment, private inventory investment, state & local government spending and consumption, along with a downward revision to imports. The same report featured the first estimate of Q2 corporate profits—profits from current production (which is corporate profits with inventory valuation and capital consumption adjustments) increased 2.4%, its first gain after 2 consecutive quarterly declines. The BEA will revise its estimate of Q2 GDP once again at the end September. Personal spending grew modestly in July, thanks to strong car sales. The BEA estimates “real” consumer spending grew 0.2% during July, following no change in June and a 0.5% increase during May. Real spending on durable goods jumped 1.3%, boosted by a 2.6% gain in spending for motor vehicles, while spending on both nondurables and for services each edged up 0.1%. Over the past year, real consumer spending has grown 3.2%, boosted by a 6.2% jump in durable goods spending and 2.8% increases on both nondurables and services. Nominal spending (not adjusted for price variation) grew 0.3% for the month and was up 3.5% over the past year. The increased spending was funded by a 0.4% gain in personal income (“real” personal income also grew by 0.4%). Personal income has increased 4.3% over the past year. The savings rate for July of +4.7% was up 2/10ths of a percentage point from June. Following last week’s report on previously owned homes, new home sales grew in July. The Census Bureau put the seasonally adjusted annualized sales rate of new homes at 507,000 units, up 5.4% for the month and 25.8% above year ago levels. Sales grew during the month in 3 of 4 Census regions, with a 6.9% drop in the Midwest being the exception. Builders were still maintaining a tight inventory of homes—there were 218,000 unsold new homes at the end of June, up 6.9% versus a year earlier but still representing only a 5.2 month supply. Nevertheless, the median sales price of $285,900 was up only 2.0% from a year earlier (although this is likely reflective of a greater percentage of smaller (less expensive) homes sold during the period). Durable goods orders gained for a 2nd straight month in July. The Census Bureau reported new orders for durable goods were at a seasonally adjusted $241.1 billion, a 2.0% gain for the month. Transportation goods orders increased 4.7% during the month, despite drops of 6.0% and 13.1% for civilian and defense aircraft orders, respectively. Motor vehicle orders gained 4.0%. Net of transportation goods, new orders grew 0.6%, thanks to a 2.0% increase in orders for computers/electronic products, a 1.5% gain in machinery orders and a 1.3% improvement in orders for electrical equipment/appliances. Orders for non-defense capital goods excluding aircraft (a closely watched measure of business investment) increased 2.2% during the month. – Jobless Claims (week ending August 22, 2015): 271,000 (-6,000 vs. week earlier); 4-week moving average: 272,500 (+1,000 vs. week earlier).